Imbolg brings the promise of renewal and hidden potential with signs of the earth awakening and life force stirring around us. Our post winter mindset reflects that of nature as we are slowly emerging out of hibernation and the seeds of creativity are beginning to rumble in our minds and bellies! Adding ritual to these times and to all seasonal shifts gives us time to reflect, examine and appreciate the interdependence of life. We believe rituals can be open ended and flexible and shaped by your context into something that is uniquely yours. With this in mind we'd love to give you some suggestions and a gentle nudge to create your own meaningful ritual to mark this important point of the year, half between the Winter Solstice and the Spring Equinox. Imbolg is known as a time of cleansing and purification. Take a ritual purifying bath with some fresh cleansing herbs hanging over the faucet. Herbs associated with cleansing and purification include: Sage, Lemon balm, Chamomile, Cinnamon, Lavender, Rosemary, and Peppermint. Use it as a time to let go of negative energy and any of Winters limiting thoughts and prepare your mind and body for the season of possibility ahead. Get cozy at home and light some white candles, or even light a fire, as a symbol of the returning light. Plan an outdoor adventure and forage for spring clippings to decorate your home. Look for snowdrops, buds and catkins and delight in what is to come. We love to create a little Imblog altar with our foraged finds! Bake with seeds and intention! Seeds are magical - pure potential! Seeds are full of possibilities. Sprinkle some seeds in your baking over the next few days and feed yourself and those around you with metaphorical and physical nourishment to get the creative juices flowing! The desire to add ritual to our lives is something many of us feel strongly. A ritual is often thought of as something traditional and formal, however we believe a ritual is also something we can create to be relevant to our own lives. We believe that nature provides us with natural times to pause and invite these rituals into our lives. For thousands of years people have been doing the same and it appears to us that it is even more important now in our society, to reconnect to nature in this way, to attune our lives to the clocks within and the natural order that exists. O H R I T U A L is our way to share this belief with others. Tonight is the harvest full moon, what could be your full moon ritual? Could it be to light a candle, to diffuse some essential oils, to read some poetry, to go for a walk or get on your yoga mat, or maybe to switch off all screens or just to pause and be mindful for a moment. She's mistress of the night." What a beautiful night we had creating and making with all who came to our Lúnasa gathering. Such a lovely way to celebrate this important time of year together. A time to reap all the benefits of seeds sewn throughout the year so far. Everyone on the night took home their own glass bottle roller with their chosen blend of Doterra Essential Oils, along with their crafted floral hanging of summer blooms. 🍃🌿🍃 "Essential oils offer us new pathways to access the wisdom of plants and the capacity to enlighten, uplift and enhance beauty in our lives"
Thank you to @urbanitycoffee for hosting us and for keeping us going with lovely wine, coffee, sweet treats and good craic throughout the night. Thank you to @wintersnicola for sharing with us her clary wisdom on essential oils and for filling the room with beautiful scents. Thank you to @ailbheodonnell for capturing the night so beautifully. Follow our Facebook page to see more of these lovely snaps. One year ago the idea of OH RITUAL was born. The two of us had wanted to be involved with a creative venture that would reflect our growing interest in celebrating the natural changes across the year. We fixed upon the time of Bealtaine as our first event to celebrate. Bealtaine being the time traditionally associated with fertility made it the perfect starting place. We chose to look at fertility in terms of creativity and the generation of new ideas. This theme formed the focus of our event and together with talks around the theme and a floral smudge stick workshop; we merged the ancient with the present. 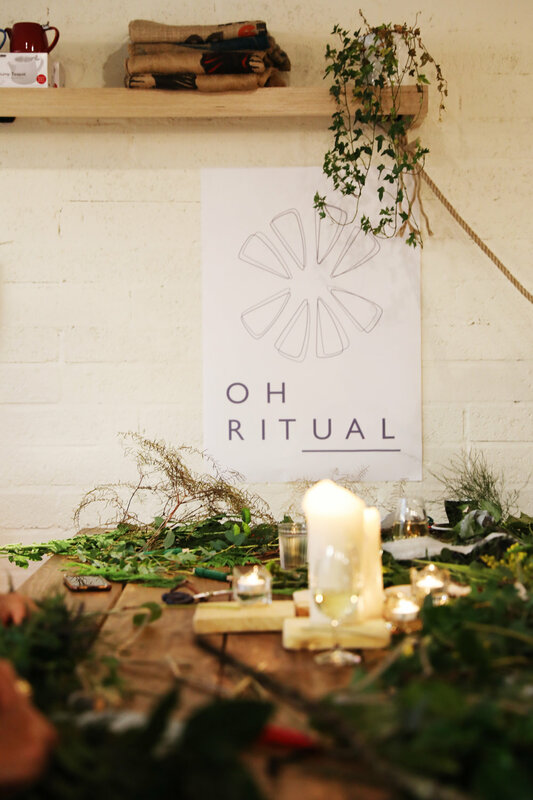 Thank you to all of the lovely women who came together for this night and helped us launch OH RITUAL. It was a really special gathering of kindred spirits and a really memorable evening to this day. We have both had a busy year since but have recently set about planning our next event around Mid Summer.